All khalil mamoon hookahs are handmade in egypt promoting the most traditional smoking experience you can find. The khalil mamoon 1001 nights egyptian shisha pipe is middle grade metal and stands at 36 inches tall and features a silver shaft with unique gold and copper accents and is designed specifically for producing a great smoking experience. With an ice chamber built in at the top to chill the smoke as it passes through the inner pipe it provides a chilling rush of flavorful smoke. 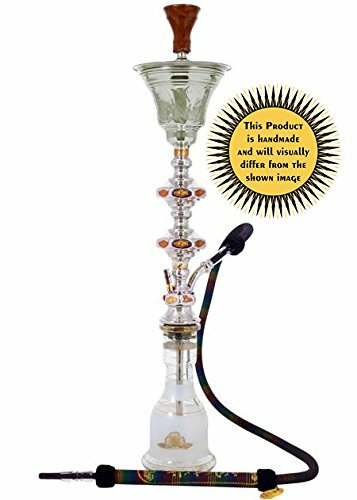 1001 nights hookah pipes have single hose capability and come as a complete hookah set including hookah tongs, clay bowl, cleaning brush set, rubber grommets, km rainbow hose, plastic mouthpiece, and setup instructions. This narguile may be used for both decorative and smoking pleasures, providing entertainment for years to come.